Let's face it, off road vehicles are fun. 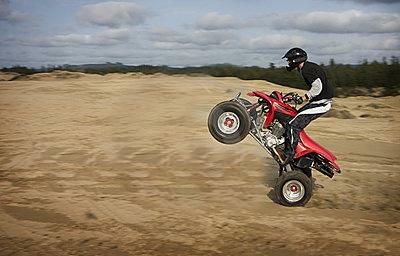 Off road vehicle insurance is a critical tool to make sure you keep them fun. Whether you are a recreational ATV rider, or use your side by side to manage miles of fence line, having it damaged, wrecked, or stolen can cause loss of time and money. We can provide different types of off road vehicle insurance to cover different types of vehicle needs. Terrain Vehicles, Quad, Four Wheelers: whatever name you call it, the fun is still just as good. If you're using it as a weekend cruiser, running around the farm, or taking it hunting - having your ATV is a lot of fun, but it's also a big investment. What happens if it's sitting in the garage and a poorly placed battery ruins the gas tank and engine? Does your homeowner insurance cover it? What if you're not on your property and have an accident? Are you or your ATV covered? Even worse, if someone steals it from your backyard, or it's hit while waiting to load your quad onto the trailer at your favorite trail - how are you going to replace it? Race on the weekend at your local track? Ride recreationally? An off road motorcycle is a big investment too. Many people who compete in enduro rides have to be registered and insured - even hare scrambles can require coverage for your motorcycle. If you participate in activities where coverage is required, or want to protect your investment we can design the right policy to protect your dirt bike too. Many of the vehicles that never see pavement, or aren't registered are of high value. You wouldn't buy an 8 thousand dollar car and not insure it, but would you buy a side by side and leave it uninsured? If you're a rock crawler why wouldn't you protect your thirty-thousand dollar toy from liability, uninsured accidents, and theft? If it falls off a trailer, will you pay damages out of pocket? If your Jeep rolls over and damages someone else's vehicle, who will cover those damages? Many offroad toys are high value, high investment, but owners simply don't think they need coverage because they're not on the road. Don't leave your side by side, Jeep, or buggy vulnerable to anything other than the trails you're on.